Anton Kristiansson is a guy who makes hip-hop indebted pop music, out of Gothenburg, Sweden. He’s been releasing songs for almost a decade, and his latest is “girl $,” a five-minute rave of digital marimba. There are flashes of English — he says on fleek at one point, and try the Swisha, mate at another. The video, above, was filmed during a trip to Japan during cherry blossom season. It documents a night of hanging out and drinking with friends, some old and some new. To me, “girl $” sounds like some afropop; with a vague resemblance, its melody also calls to mind “Bruk It Down,” the recent Mr. Vegas classic. 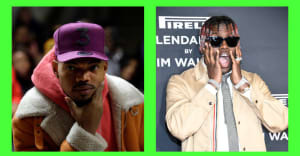 Apart from its sound, the song seems to share a sense of gratefulness with dancehall and afrobeats songs like Popcaan’s “Everything Nice,” or D’Banj’s “Superstar” — or new gospel-adjacent American rap songs like Chance The Rapper’s “Summer Friends.” I can’t offer much context for this song, or explain how exactly its connected to all the others I’ve just mentioned, but there’s no question that the world is scary now and may not soon feel safer, and it’s not surprising to me that, in all these corners of the world, people would seek refuge in ecstatic music for parties, or technology that smoothes imperfections out of vocals. In your teens, or twenties, or thirties, or beyond — there’s never a bad time to think about the life you want to live. And when you stumble on a weird gem like this, it's hard not to feel thankful for the one you've got.